Note: Please click here for the original recipe. Yesterday, I wrote in to give you a brief first impression of the super-cheap brownie, which was based solely on the batter. I hadn’t even taken the sumbitch out of the oven yet, but given my impatience with weeknight baking, plus my absence over the past two weeks, I felt compelled to write something. But I am happy to report tonight that my first impression was in fact wrong. These brownies, made with flour, sugar, eggs, cocoa, instant coffee and imitation vanilla from Aldi, turned out wonderfully, and I’m not kidding about that. I expected the flavor would somehow be wrong: a little metallic from the bleached flour, maybe. Or, because bleached flour tends to resist gluten formation, I thought the flavor and texture could be too floury and dry, like a cake doughnut. I thought the chocolate flavor would be like something out of an Easy-Bake oven, both childish and papery. And the instant coffee? That stuff really does smell terrible. Now, the batter really did support my assumptions. But the actual result? The flavor is rich, very adult, almost as if the cocoa were Dutch-processed. It has a distinct fruit note to it as well, reminiscent of chocolate sourced from Ecuador. Your tasters may not enjoy this as much as I did, but I for one am very excited that something so interesting can be had for so cheap. This is not to say that they are perfect yet. I mean, they’re damn close, but I wouldn’t have spent, what, the better part of two months working on stupid brownies if damn close would do. Here are some small issues, all easily fixed. Flour: The flour did not impart any odd flavors, nor did it resist gluten formation to the extent that the brownies seemed grainy or dry. (I suspect this lot has a protein content in the 10.5 to 11 percent range.) That said, despite a desirable chew, my tasters did detect a slightly drier texture right away which, although they’ve set wonderfully overnight, leads me to believe they may not stay that way. My recipe calls for one stick of butter; as a remedy I would add, to start, another two TBL of butter. This will add a) a bit more saturated fat to help combat this dryness; and b) a bit more water to encourage, as best it can, a little more gluten formation. I do think this recipe, using bleached flour, could use up to another four TBL if necessary without becoming greasy. Coffee: I used three TBL of the instant coffee here. And while it enriches the flavor, this much does unfortunately impart a coffee aftertaste. After setting overnight, this is far less noticeable, so it’s not a dealbreaker, but it still shows up a minute or two after you’ve tasted it. Two TBL, however, should work just as well. You may also want to consider substituting some or all of the 1/2 c. of water with brewed coffee, depending on your taste. Either way, I would not again use three TBL of instant coffee when making this recipe with house-brand ingredients. Vanilla: Because house-brand vanilla is a little, well, vanilla, I also bumped this quantity up to three TBL. (If you are using a densely flavored vanilla, for example, you may not need as much. Using an American, or at least Americanized, imitation vanilla, you very well may.) I would recommend that when baking these brownies with house-brand ingredients, including the vanilla, you use a full three TBL. Salt: My recipe already calls for a lot of salt–two tsp–but either because of my adjustments or the behavior of the bleached flour, the flavor, I found, lacked ever-so-slightly the full body that makes bakery a success. These things are right on the edge, but to be safe, when using house-brand ingredients, I would use 2-1/4 tsp of salt. Process: I decided that instead of adding the sugar to the chocolate mixture, I added it to the egg mixture where I could let it set, activate, then stir it every few minutes, starting the process all over again. I did this because I was concerned right away with the cocoa: The more active the sugar, the better results I might get from the cocoa. I’m not sure the cocoa needed any help–I am honestly impressed with it–but this is an easy process change that can only help the flavor. And at the very least, this very active sugar added more shine to the top, and gave the edges a lovely, slightly caramel flavor and the perfect bite. The best part of all? The price, of course! Nothing was more than $2 in whole and certainly far less in part. 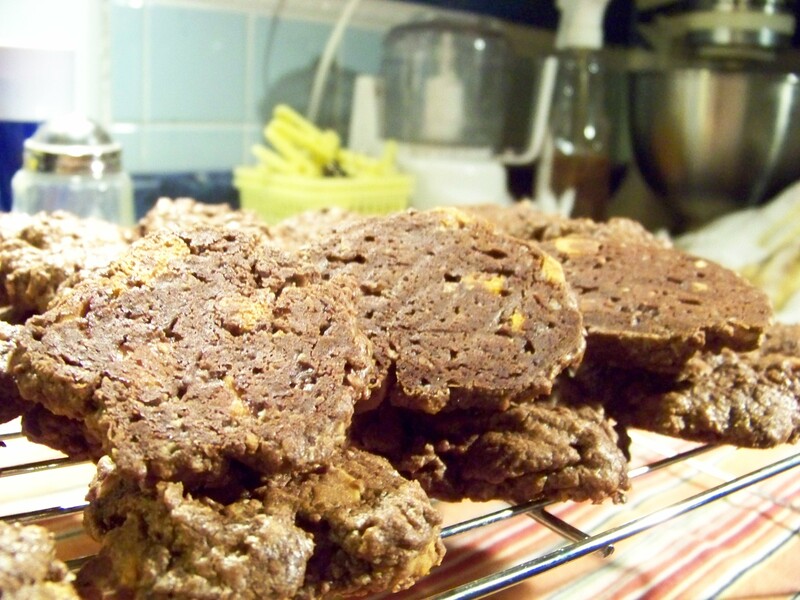 I would estimate, then, that per 9″ x 13″ pan these brownies cost approximately $2.32. The initial test? The very first one, the brownies made with the organic ingredients and flippin’ $12 vanilla? After splitting out the ingredients, those cost $8.32 and were not, I repeat, not even close to being comparable, let alone, better. Please let me know if you have any questions, and I’ll see you tomorrow! I promise I’ll come up with something new to bake then. Here are some quick first impressions. A more detailed report will follow. 1. House-brand cocoa is not terribly chocolatey. The flavor of the batter would indicate that at 1-3/4 c. it cannot compete with 2-1/2 c. of sugar. The question will be how to adjust for this. Of course, this point may be moot once they’re done. 2. The house-brand flour I used appeared, felt and behaved like flour with a higher protein content than typical all-purpose flour. That said, it’s not by much and to be honest, in a pinch, it’ll work better than I’d originally thought it would. 3. House-brand imitation vanilla? Not as good as the Mexican versions available in more urban areas, but again, it’ll work in a pinch. 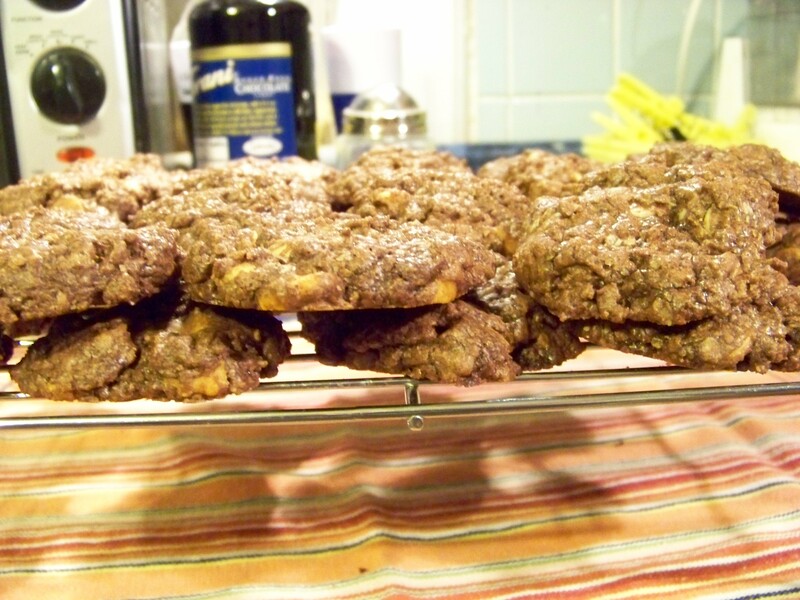 I still maintain that in something like brownies, oatmeal cookies–less than delicate bakery–imitation vanilla will work even a bit better than pure extract every time. 4. House-brand instant coffee: Wow, I wouldn’t recommend using that stuff if you can help it. The point here though is to make something great out of next to nothing, so I used 3 TBL to mimic the usual espresso paste. 5. They still smell fantastic! Stay tuned. I’ll report on the actual finished results tomorrow. See you then! I’ve got a new project. Now that I’ve thoroughly tested my perfect brownie recipe, I want to find out if holds up under distressed conditions: House-brand cocoa; house-brand, bleached all-purpose flour ; and seriously cheap, house-brand instant coffee. All I have left to buy is the generic–and yes, imitation–vanilla. I’ll be using ingredients that are thought to be maybe a half-step better than that stuff that comes in no. 10 cans with a plain white label, which I’d use for this test if I could find it. Now, I’m certain several tests will be necessary. House-brand, bleached all-purpose flour has a protein content than can vary not only by the store, but even from batch to batch in the same store. It will take some work, I suspect, to develop a general rule for baking with it. Flavors will likely be an issue as well. Like the flour, house-brand cocoas,vanillas, and instant coffees can vary in flavor and quality, and all within the same store. It really just depends where the store sources its products from contract to contract. I plan to keep my methods constant, but I’ll develop all new proportions and adjustments with this variance in mind. See, one of my goals here is to make baking as accessible as possible. Not just the directions and the science, but the cost, too, And while I already insist on using ingredients that are easy to find, it’s time to figure out how to bake great things with the ingredients that’ll make your typical food jag laugh at you behind your back. Let’s show ’em that real skill and confidence–and taste–has nothing to do with name and price.